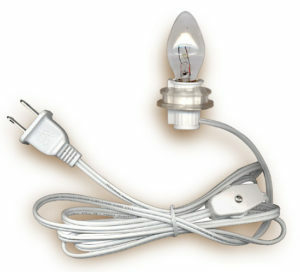 Lamp Cord Set with candelabra base LIGHT BULB provide everything in one convenient package to light your project. Includes clear, steady-burning light bulb. Lamp Cord Set also have switch to turn your project on and off. Components Are U.L. Listed. “A” Is Also Canadian Certified. 12′ 15′ 19′ Lamp Cord Set is individually inspected for quality and for safety. E26 lamp holder. 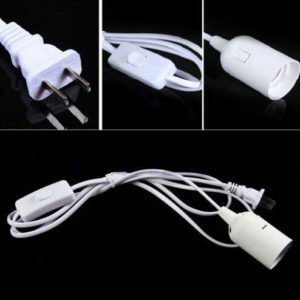 The Lamp Cord Set has an on/off switch and a standard polarized plug for US and Canadian electric systems. Comes with hanging hardware. James Lamp Cord Set kits will work with most paper lanterns and nylon lanterns. Many customers use our lantern cord kits for infinity lights.